Hearken unto me, U.S.A! For verily I am a voice crying out in the wilderness (what's left of it). I am the humble and not-so-great I Am, namely, Anne Johnson. Look upon the prophetess of Vulture and take heed! 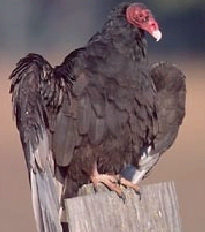 For upon this day, Vulture sulketh upon His holy fence post of Wenonah. He gnashes His beak on said post, which hurteth, and maketh Him even more petulant. Thus speaks Vulture: "Hsssss Hssssss Hssssss." He who groweth hair unnaturally upon his head, lo, he is an abomination. *** Unto him and those who follow him will be a plague of those little biting flies that hover around beaches and bays in the summertime! For I am Vulture, and My ways will be followed. I am a jealous Bird, quick to rise to righteous rage. And this should be familiar unto ye who have come to My Holy Church from other venues. HUMBLE THYSELF OR WATCH THY NATION CRUMBLE TO DUST UNDER THE WEIGHT OF TYRANNY. That's better! It's been awhile. The Great Vulture hath asked me to bring a sorry nation to heel. Verily, every Saturday during which I am not marching unto that end, I will deliver here a sermon, in obedience and submission to Vulture. Vulture is the Highest of Holy. He killeth not. Nor doth he sound harsh calls unto the air. He keeps the world clean. And it is Vulture's expectation that His servants, the human race, likewise keep the world clean as a whistle. This is why He now gnashes His holy beak on the holy fence post of Wenonah and becomes petulant. U.S.A., we are failing Vulture. O dreadful turn of events! Vulture makes demands, which we must meet. Yea, verily the possum on the shoulder of the road is the smallest and most inconsequential of Vulture's demands. My Saturday sermons will acquaint you with the Great God Vulture and how to please Him, thereby bringing LIGHT INTO THE WORLD for everyone! Don't miss one single Hsss, my flock. A world fit for Vulture is a world fit for humankind. ***Except should he or she be recovering from an illness which removeth hair due to medicinal treatment. But only then. praise vulture! praise his mighty being! I hear and obey, O Mighty Prophetess of Vulture! I will hearken unto thee each Saturday and heed thy words of wisdom! I was in a most unfortunate car accident a few days ago, but my car is still operable. As I turned the corner to my street, I saw a dead cat in the street. Feasting upon it were four vultures. I have never before seen vultures in my neighborhood. I know the reason for their presence.